Since Upper Bucks county was originally a center for farming, it is only appropriate that our parish and school is named for St. Isidore, the patron saint of farmers. This heritage is also reflected in the slogan on our shield logo: Radicatum in Fides. We are Rooted in Faith. Isidore entered the service of the wealthy Juan de Vergas, in whose employ he spent the remainder of his life. Isidore’s wife, a saint also, Maria de le Cabeza [Torribia], bore him one son who died at an early age. Isidore won the respect and admiration of all, especially his employer, by reason of his unusually devout life. Miracles were associated with him even during his lifetime, e.g. angels doing his farm work when he lingered overlong in the local church. After his death his reputation for sanctity grew, culminating in his canonization on March 12,1622 by Pope Gregory XV. His tomb is in the Church of San Isidro in Madrid, Spain. Isidore is the patron of farmers and of the U.S. National Catholic Rural Life Conference. Citation: The New Catholic Encyclopedia. Vol. 7, New York: McGraw-Hill 1967, page 672. 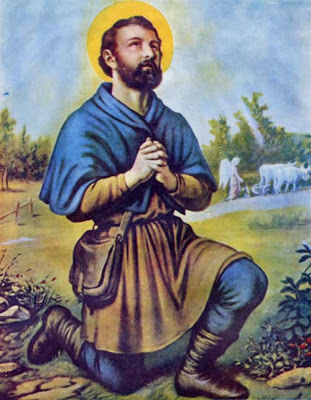 The National Catholic Rural Life Conference has additional information about St. Isidore and St. Maria including a litany and a novena in St. Isidore’s honor. Wikipedia also has an extensive article.